But this year, I didn’t want to abandon my Women Writers Wednesday series, which has been so much fun and so well received, and so this month, I’m hoping to have WWW reviews of female poets. 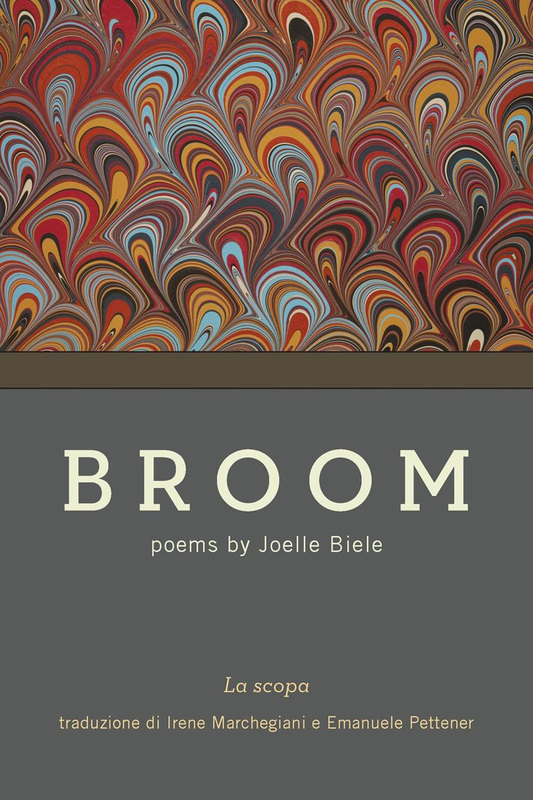 We’ll commence that today with Anna Leahy’s review of Broom by Joelle Biele. There is information at the end of this post on how to contribute to the WWW series, if you’re so inclined. And I may still end up with a couple of spots left over in the Poet-A-Day series this month, so if you’d like to get in an eleventh-hour submission, now’s a really good time to contact me. Joelle Biele and I studied together as MFA students at the University of Maryland years ago. Though I haven’t spent time with her since, she was then an incredibly attentive, writerly reader and a very good poet, so I have followed her career—the poetry collection White Summer and the book of Elizabeth Bishop’s correspondences with The New Yorker that she edited. Two of Broom’s poems, “Apologia” and “Birthday Poem,” appeared in TAB, the literary journal I edit. Perhaps, these connections make me not objective enough, but it seems more likely that Joelle has earned my respect through her writing over the years and that my awareness of our connections increases the burden I feel to explain my enthusiasm for her new book. Broom is the winner of the Bordighera Poetry Prize, which is funded by The Sonia Raiziss-Giop Charitable Foundation and is housed at the John D. Calandra Italian American Institute. As a result of this context, the poems in Broom appear in English on left-hand pages and as Italian translations by Irene Marchegiani and Emanuele Pettener on right-hand pages. I don’t read Italian, but I appreciate the juxtaposition and the visual and tactile reminder of the larger world, the wide audience for poetry, and the notion that words and form matter. More than ten years ago, poet Beth Ann Fennelly published an article called “The Winnowing of Wildness: On First Book Contests and Style,” which explored the pressures that emerging poets are under to produce a stylistically and/or thematically cohesive collection. Fennelly argues that someone like Elizabeth Bishop would have likely not produced North and South as we know it, that we would be left with “an impaired understanding of her development as a writer,” and that we would not understand her later poems as deeply. I agree with Fennelly to some extent but must admit that I often like the ways poets play with cohesiveness in a collection and think Broom is an especially terrific exploration of both coherence and range. Biele conveys a voice, style, and loose theme and uses that to expand, spinning closer to and further from those elements. Numerous fourteen-line (sonnet-length) poems to her children Katherine and Andrew are threaded through this book. In the poem “To Andrew: at Seventeen Months,” the child asks the speaker for the kitchen broom, sweeps and role-plays with it, all the while “waving your baton, directing me / into my life, into what I don’t know.” In these poems to the two children, the speaker is learning, often awed, sometimes worried, and always tilting into the next moment and the next. So these poems are about motherhood and about childhood but also about how any of us might experience life, open to experience and appreciative of the fleeting moments that continue to shape us year after year. Biele’s poems attend to form and rhythm, so I was surprised to find a short essay as the third of four sections in the book. This prose piece fits beautifully; it discusses the past, childhood, danger, response. “The Field” negotiates emotional and intellectual understanding of the past and made me think about events of my own past that shaped me or, interestingly, didn’t. Joelle and I grew up making up our own play, whereas children these days have scheduled play dates. Reading this piece cast me back into other poems, seeing them as even more suggestive of universal touchstones. Broom, then, suggests that we can look back to see how we have become who we are, though that’s a precarious understanding that doesn’t predict the future. What happens to the speaker in these poems did not happen to me, but we each have people, places, and events in our lives that create meaning. To survive, we must change and allow ourselves to be changed. We continually become who we are, Broom beautifully asserts. Anna Leahy’s book Constituents of Matter won the Wick Poetry Prize, and recent essays appear at Literary Orphans and OZY. She teaches in the MFA and BFA programs at Chapman University, where she curates the Tabula Poetica Reading Series and edits the international journal TAB. She co-writes Lofty Ambitions blog at http://loftyambitions.wordpress.com.